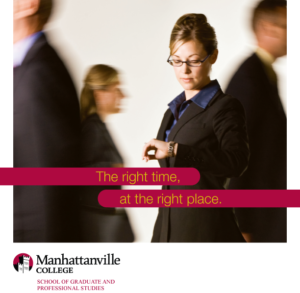 Manhattanville College wanted a 6-page brochure to encourage prospective students to enroll in, or at least find out more about, the school’s business-focused Masters Degree programs. The brochure had a dual use—printed for distribution at recruitment events and downloaded as a PDF from the Manhattanville website. So the challenge was to provide enough helpful information to get prospects to take action without overwhelming them with too many details. Obviously, the course descriptions had to be appealing, but we also wanted to get students interested in Manhattanville itself. We used feedback from staff interviews and a competitive analysis we conducted of competing area schools to highlight Manhattanville’s key differentiating features such as their small class size, 1-on-1 learning environment, industry-driven curriculum, use of real-world case studies, and class instructors who are leading business practitioners in their fields. We also included quotes from current students and recent alumni who talk of how they apply what they learn in the classroom to the workplace.